Humans have always wanted to fly. The idea is embedded in our mythology, from Icarus to Superman. But while airplanes have been around for a century, it’s only in the past few decades that we’ve developed technologies that let us come close to flying like the birds do – “in other words, flying without without a motor or a machine, with nothing between us and the sky. Paragliding is one of these technologies. Paragliding is probably the easiest and fastest way to feel like you’re flying, since beginners can get up in the air with much less training than they can with, for instance, hang gliding. But who invented paragliding? Who was the first person to try it? There are a few strands to the story. For many years, mountain climbers in the Alps had been using small parachutes as a way to get back down the mountain faster after a long climb. That was, arguably, the origin of the current sport of paragliding. The small parachutes those mountain climbers used, called ram-air foils or parafoils, are the same kind now used for paragliding. They differ from normal parachutes in an important way: they inflate to form a wing, so that the user can steer his or her flight. By the late 1970s some of those mountain climbers in the Alps who had been using parafoils after their hikes started to focus more on the flight down the mountain than the climb up. They also discovered they could utilize rising air currents to prolong their flights. Thats when paragliding as a separate sport really got started. A few of those pioneers perfected the technique of running and jumping off a slope, at Mieussy, France, making Mieussy an early hub for paragliding. And what about the word “paragliding” itself? That seems to come from a 1985 book called “The Paragliding Manual.” It was the first true manual for the sport, and was written by Patrick Gilligan, from Canada, and Betrand Dubuis, from Switzerland. Soon these paragliding innovators introduced the sport to hanggliders and other flight enthusiasts. As a result paragliding, well, took off. 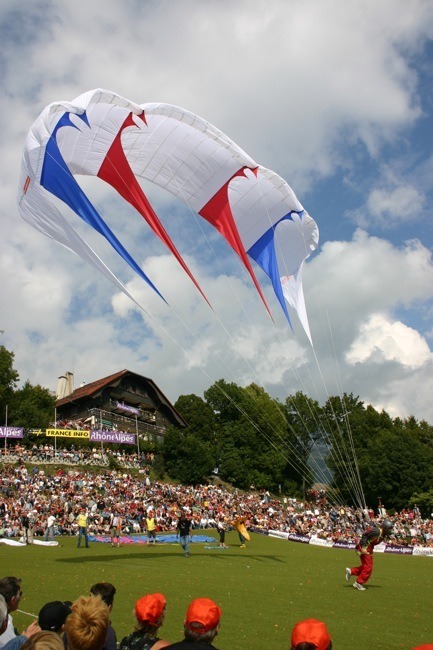 In 1989, the first Paragliding World Championships were held in Austria.